Iwaki, Fukushima—This morning the FSM’s President Christian met with Japanese Prime Minister Abe for a bilateral meeting at the Resort Spa Hawaiians in Iwaki, Fukushima, Japan. The meeting took place as a side meeting to the PALM 8, the Pacific Island Leader’s Meeting that has been held every three years for the last 21 years. After the country leaders conveyed their mutual greetings and expressions of support, the media was ushered from the room, a standard practice. 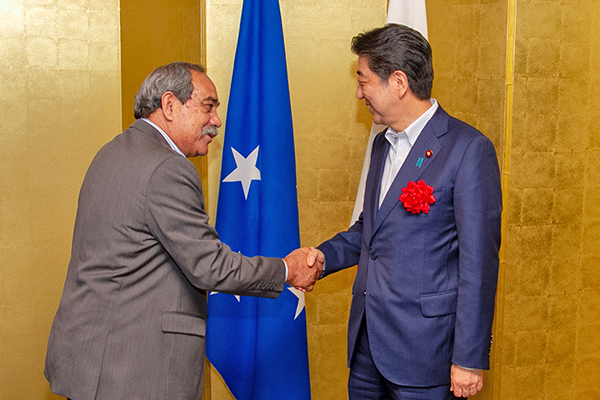 According to a translated press release, Prime Minister Abe noted that this year marks the 30th anniversary of the establishment of diplomatic relations between Japan and Micronesia. He would like to further strengthen the relations between the two countries and that at PALM8 he would like to discuss the issues that the region is commonly faced with such as maritime security, climate change, disaster prevention and others. 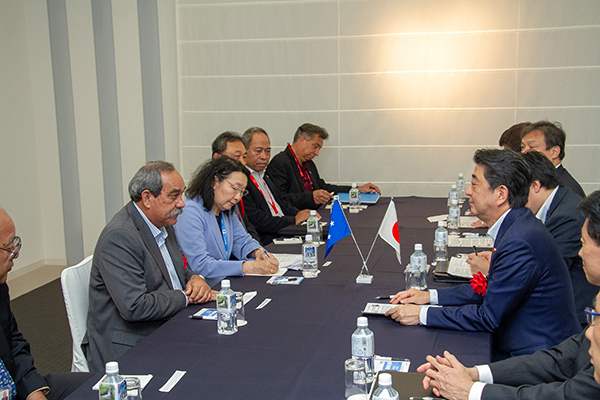 He said that Japan intends to ​​grant aid of 200 million yen (approximately $1.8 million USD) to Micronesia to strengthen disaster prevention and reduction capacity. In response to this, President Christian expressed appreciation for Japan's long-standing support and stated his respect for Japan's leadership towards the success of PALM8. PM Abe stated that he would like to coordinate and cooperate with Micronesia under the "Free and Open India-Pacific strategy". In response to this, President Christian expressed his intention to continue to closely cooperate with Japan. In addition, Prime Minister Abe asked for cooperation towards the stable operation of Japanese fishing vessels, cooperation in the collection project of the remains of Japanese soldiers, and cooperation towards the early resolution of the abduction issue with North Korea. President Christian expressed his willingness to discuss the North Korea issue with Japan.